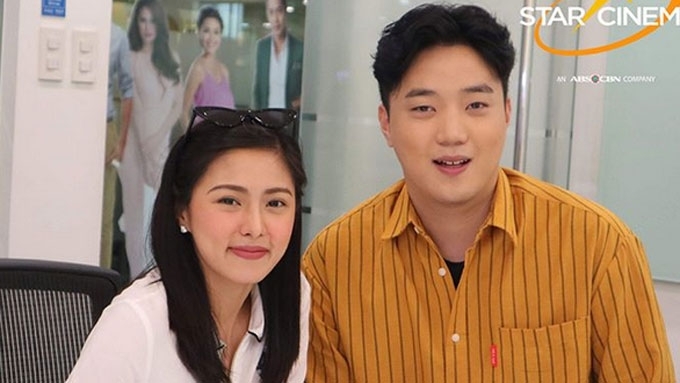 Kim Chiu will be paired with Ryan Bang in a new horror-comedy flick by Star Cinema. Kim Chiu is gearing up for her next movie. This time, the ABS-CBN actress will be paired with a new leading man: Ryan Bang. A story conference for the still-untitled comedy-horror movie was held last January 31. Kim and Ryan will be joined by comedians Pepe Herrera, Lassy, and Moi Bien in this film to be directed by Tony Reyes. In an interview with ABS-CBN News, Ryan expressed his excitement over his team-up with Kim. He said, "Kasi si Kim Chiu ang pinaka crush ng mga Korean dito sa Pilipinas! "May mga hindi kilala si Ryan Bang, pero kilala si Kim Chiu ng lahat. Lahat ng kaibigan ko nababaliw na. Promise!" Kim also posted a photo with Ryan on her Instagram account, using a few Korean words. She wrote in the caption, "OPPA GANGNAM STYLE!!! @starcinema DAEBAK!!!! kaya ba namin?!! kakayanin!!! AJA!!! lezzzdothis @ryanbang"
"Daebak" is a Korean word which means "big win" or "great success," while "Aja!" is an expression that means "Never give up, never stop fighting." Direk Tony said about the film, "Magkakaibigan sila rito. Tropa silang lima. "Doon natin ipapakita ang closeness ng true friendship, nandoon ang love, at may kaunting heartache paminsan-minsan na natural lang naman sa pagkakaibigan." A release date has yet to be announced though Direk Tony said that Kim has already started filming for the movie.